It is taking too long. The plan is to move only the things I need back into the room, everything else goes Out or In the Cellar, or AWAY – whatever it takes. I am thinking that this project that has swallowed months is a good candidate for both the August TIF challenge (balance in life) and the Sept one too (lists of things). 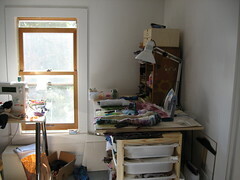 I need the balance between stuff visible, and room to put things together. Between visual stimulation and room to make my own ideas. A sufficiency of supplies without overwhelming clutter. Kirsty Hall has a lovely post about how balance is what it takes to not fall off the beam (thinking specifically of gymnastics). It isn't a static place, but a moving target. Some weeks a lot of this, other times more of something else. And for the lists? Well, I've found myself finishing projects that have languished long enough rather than repack them into the (new! clean! space) for finishing later. Because this is later, and I might as well do it now. So I am thinking both my TIFs are done and I can devote myself to getting the rest of the way back into this room without worrying that particular issue. Like a slow snail, there are still boxes stacked in my bedroom, and I ahve to draw the rest of the stuff into the room or leave it behind. And this is post # 500. I can't believe I have that much to say! I can't believe you have read this far! Many thanks..
Dept. of Gender Equality inches forward…. May I be excused, please? “Kirsty Hall has a lovely post about how balance is what it takes to not fall off the beam (thinking specifically of gymnastics). It isn’t a static place, but a moving target.” ———– I like that!! Thanks for the link! tou are reflected in the puppet girl’s eye making them look like cat’s eyes. Neat. lee – i’m reading about your cleaning out and clearing up and wish i had the room to move everything out and start over. i would put boxes of unwanted things on the curb and it would all moagically disappear to happy homes. i love what you said “this IS later”. thanks for coming to play on the street team.